Home / Blog / Do You Know How To Set A Dial Bore Gage? Do You Know How To Set A Dial Bore Gage? A vernier or dial bore gage directly measures a bore. It has 3 symmetrical anvils protruding from the gauge body that are linked to the micrometer mechanism. With the rotation of the knob, the anvils move in and out with respect to the measurement. To increase reliability and take the feel out of the device, the knob has a slipping mechanism. How To Set A Dial Bore Gage Properly? It is a relatively simple concept to set a dial bore gauge, as per the instructions given below. Based on the size bore you will be testing, set the micrometer. With extensions compulsory for the bore’s diameter, set up the dial bore gage. The bore gage is then placed between the anvil and spindle of the micrometer. Rock the gage side to side and back and forth in the micrometer. Zero the dial indicator to the minimum reading. All these sound simple only when you have proper tools to get the job done! If you are looking to set a dial bore gage manually, it can be tricky. Since you are holding the gage in one hand and micrometer in the other, it becomes difficult to zero the reading when both of your hands are at work. This amplifies the chances of compromising with the measurements, since you don’t have a third hand! Generally, most workshops make use of a vise to hold the micrometer unwavering. Here, the vise is acting as a third hand. 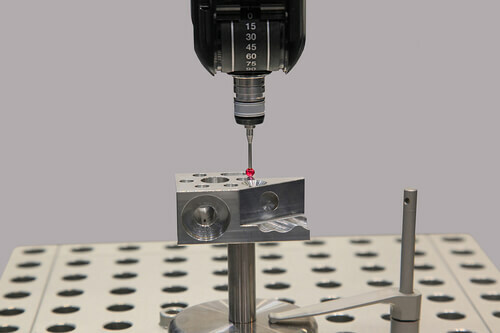 However, you still need to do some balancing to zero the dial, since the round point on the extension will have a tendency to slide off the micrometer spindle. You can slip a piece of quarter inch hose over the spindle to avoid this. Let it broaden just enough to allow the extension’s tip to slip inside, steadying the entire assembly. It won’t hold the gage all by itself, but will make it difficult for the spindle and extension to slip apart, without affecting the readings of the micrometer. Another inexpensive trick is to apply the micrometer after mounting the gage in the vise. This way, you will be rocking the micrometer, rather than the dial bore gage. It actually works better than you think. Make sure no damage is done to the shaft, when the dial bore gauge is mounted on the vise. This technique works out properly with a Micrometer Stand as well. Designed on the same principle is the Fowler Micrometer Stand, which is known as the third hand. It can hold any type of micrometer, but make sure it stays put, by tightening the knob gently. The benefit of using this stand is that you can alter the angle of the jaws to work with the gage and also see the micrometer properly. If you are looking to get one for your shop, you can buy an authentic model from Willrich Precision Instrument Company in Cresskill, NJ.